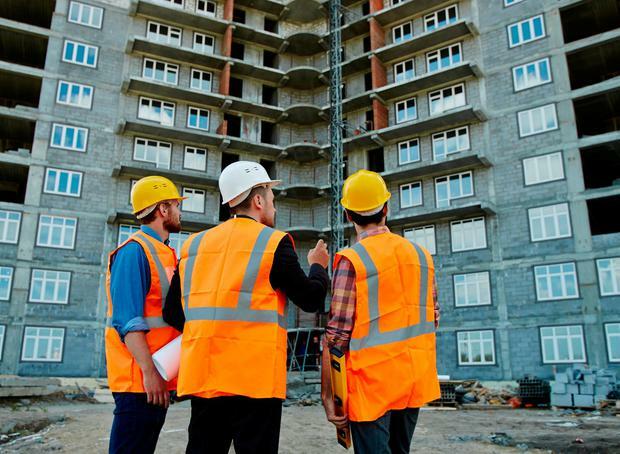 The cost of building a two-bedroom apartment is way in excess of the selling price, meaning few developments are likely to go ahead unless the Government tackles Vat, levies and other costs, a new report claims. The Society of Chartered Surveyors Ireland (CSI) says it is cheaper to build a three-bedroom semi-detached house than an apartment, and that a couple would need a joint income of at least €87,000 to afford to buy an apartment - but only 20pc of the population has this salary. 'The Real Costs of New Apartment Delivery' report analysed three apartment types - low-rise suburban (up to three storeys with overground car parking); medium-rise suburban (three to six storeys, with some underground parking) and medium-rise urban, of five to eight storeys with underground parking. It found that a two-bedroom unit in low-rise suburban would fetch between €298,000 and €308,000, but each home would cost between €293,000 and €346,000 to construct. For medium-rise suburban, the selling price ranged from €318,000 to €386,000, but the costs were €400,000 to €418,000. In the medium-rise urban, selling prices ranged from €337,000 to €441,000, but they cost between €470,000 and €578,000 to build. The report comes as the Government plans to remove height restrictions on apartment blocks in urban areas, and remove the need to include parking spaces near high-capacity public transport links, in an effort to combat urban sprawl and reduce prices. Figures from the Department of Housing show that in the first eight months of this year, more than 1,900 apartments were completed from a total new-home output of 11,900. Paul Mitchell, chair of the residential group within CSI, said that, in many cases, new schemes may have been built on land bought for cheaper prices than today, or houses being built in the development were subsidising the cost. He added that its analysis was based on 28 schemes totalling 2,146 homes, but they were all in planning or were not going ahead because they didn't stack up financially. The cost of building a three-bedroom house was €333,000, a report from CSI last year said. "Apartments are always more expensive that houses," Mr Mitchell said. "We're saying the lowest category of apartment is €293,000. The schemes [the report is based on] are losing money. These are schemes in planning, at tender stage but not yet constructed. In some cases, they're estimates, in others, they've gone to the market, and these are the lowest prices." The report says that the site cost makes up 16pc of the total price, the 'bricks and mortar' accounts for another 43pc, and the remaining 41pc is made up of 'soft costs', including €9,000 in selling costs, levies and Vat. The builders' profit makes up €52,000, or 12pc. Costs could be reduced by removing the requirement for car parking (€2,000-€36,000 per unit), development levies (€10,000-€13,000), cheaper finance at 7pc (€5,000-€11,000), a 9pc Vat rate (€13,400-€19,820) and making apartments 10pc smaller (€6,000-€9,000).